Mr. Schu: Congratulations on the publication of Soccer Star! I appreciate you taking the time to answer four questions and finish two sentence starters. Paulo Marcelo Feliciano (Felino when he’s famous), Maria, Jose, Givo, Carlos, and Pedro are brave kids who will stay with readers long after they read the last page. What inspired you to tell their story? Mina Javaherbin: Paulo, Maria, Givo, Carlos and Pedro are smart and fun loving children who are usually not represented on our TV shows and billboards, but they are definitely here. It’s good for us, and by us I mean the dwindling middle-class of the world, and incidentally the main consumers of picture books, to see how the majority of the children in the world live. It’s good for us to read about children who need to forfeit going to school and work to help their parents provide shelter and food. 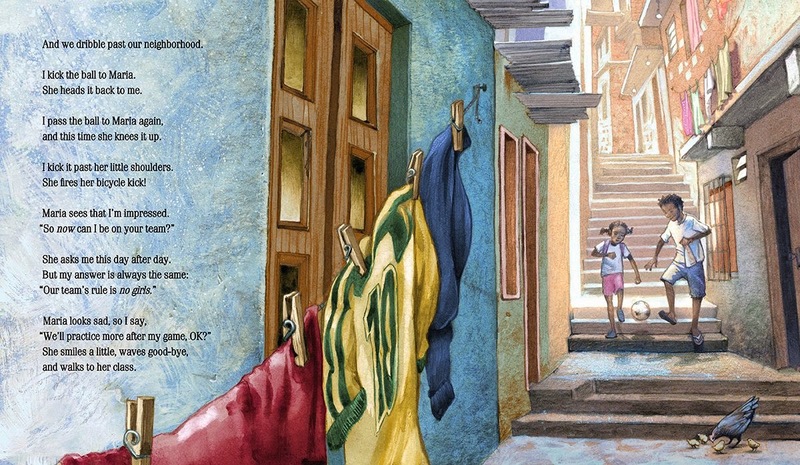 It’s important for young readers to know that Paulo and his friends want to learn math, read, write and play soccer too. Like us, these children have dreams and hopes. I admire their determination. 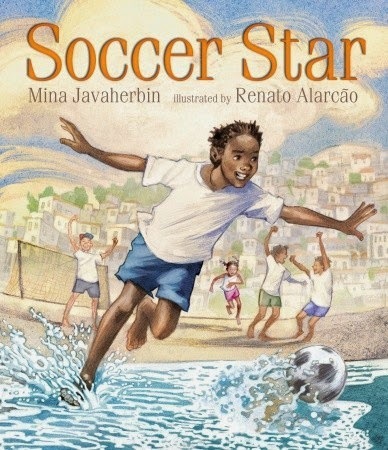 These characters are inspired by all footballers from Brazil and beyond who raised from poverty and became shining stars. Mr. Schu: Why is it important for young readers to learn about people’s lives around the world? Mina Javaherbin: I watched Neil Armstrong on our black and white TV in Iran when he set foot on the moon. This was one of the most awe-inspiring events I witnessed when I was in elementary school. To the audience in USA, Armstrong’s step may have had a patriotic value, to us around the world, it was indeed a leap for all humanity. Today’s elementary students’ awe-inspiring event is the internet, connecting them in nanoseconds to the entire world! Children today have the power of linking to the furthest parts of the world via their phones, tablets and computers. 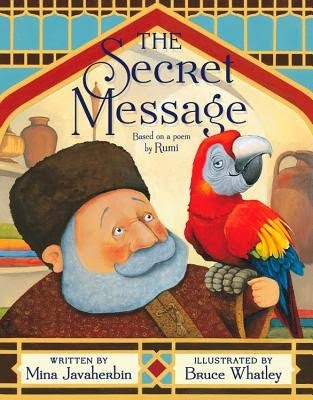 Familiarizing these young readers with world cultures enables them to embrace the global village they are destined to live in. They need to become multi-cultural, or know about it, as they have to work hand in hand with the world to find solutions for the universal challenges we are leaving behind. Mr. Schu: You are a trained and practicing architect. Tell us the Reader’s Digest version of your path to writing children’s books. Mina Javaherbin: Ever since I remember I used to read, write and tell stories. But I thought becoming an author is like becoming a prophet and it only happened to a chosen few. I never thought I could become an author, even though I wrote daily. So I studied to become an architect, my dream career, since the day I traveled to the magnificent city of Isfahan in Iran. One day a painter friend told me that I was a good writer, and I should publish some of my work. Later another friend suggested me to her own agent who incidentally worked in the children’s market. I sent them some of my children’s stories, they published a few and here we are. English is my second language and instead of literature I studied calculus in school! But all creative endeavors share similar aspects, and everything I learned about writing I learned in architecture school. I miss architecture a little lately since I’ve been very busy finishing my screenplay and my YA trilogy. Mr. Schu: You’ve taken your readers to South Africa, the Middle East, and Brazil. What can you tell us about your next book? Mina Javaherbin: My next book is a picture book to be published by Scholastic in 2015. It’s an ancient story with its’ origin in Sanskrit tales. My editor says it’s a book for children of 4 to 94! 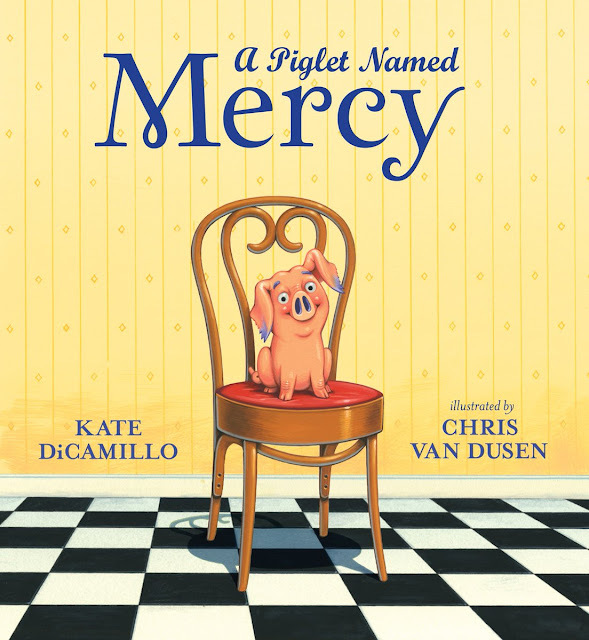 The book is a retelling of a timeless and universal story and you might have heard a version of it at some point. The government shut down of 2013 convinced me that this book should become mandatory reading for the US congress, and alike. 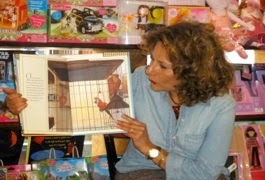 Picture books are transformers between the world and young readers. This makes them one of the most challenging and potent forms of writing. Reading is a human specific act to convey knowledge. Humanity advances through the reading of their written word and building upon it. Societies that can no longer read, write, and communicate their knowledge and stories become extinct. I am giving away one copy of Soccer Star. 1. It will run from 4/14 to 11:59 p.m. on 4/16. 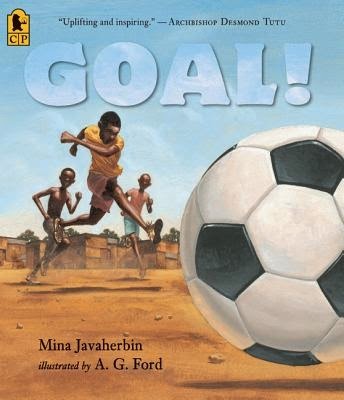 Borrow Soccer Star from your school or public library. Whenever possible, please support independent bookshops.